It didn't even last a week and there they go, tearing up Franklin Street!! Reminds me of a book John Nichols wrote about Chama New Mexico, "The Magic Journey"?, where the roads were constantly being repaved, dug up, replaced and detoured. But no. I talked to the "Jefe" and he said it was a planned event. Turns out the various accesses to sewer, water and what-not were left well below grade while the "train" was doing its resurfacing process. 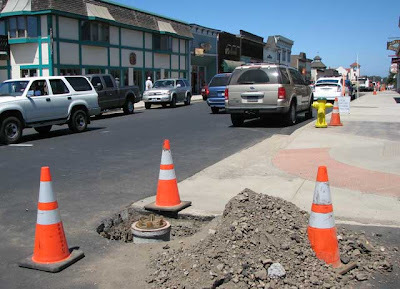 Now that the street is finished these utility accesses need be dug up and extensions added to them to bring them up to "grade (level with the new road bed). Makes sense but oh boy. Just when I thought it was over, there they go again!! But we are lucky! Do you know they are closing the northbound lanes of Interstate 5 through Seattle for two weeks starting tomarrow! Wow! The Seattle Times says: Get ready for a big honking mess! Okay Okay! So I Asked!